from my childhood, i remember bowls of nuts around the house during thanksgiving and christmas with old-fashioned metal hand nut crackers. i really haven’t thought much about that custom for years, but this year, i decided to make a pecan tart for christmas day. i found a recipe in nigella lawson’s christmas cookbook, which i had not yet tried. this recipe turned out to be a delicious mixture, and this tart does not resemble a pecan pie at all. if you can eat this tart while it is still warm, with a scoop of vanilla whipped cream, i promise it to be the best you have ever tasted. typically, i don’t like pie, and pecan pies seem to have a gummy layer that just has never interested me. if you have had similar experiences with pie, give this tart a try. nigella calls this recipe, pecan plus pie and provides a simple pastry crust that just presses into the tin. no rolling is necessary with this tart crust. this tart will serve 12 people or less over a period of several days. the tart holds up. no runny filling and no soggy crust with this recipe. preheat the oven to 350 degrees. in a large bowl, mix 1 1/2 cups all-purpose flour, 1/2 teaspoon salt, 1/2 cup vegetable oil, and 1/4 cup whole milk to form a rough damp dough. using a 10 inch round and 2 inch deep tart pan (i used a square pan instead) press the dough into the tin over the base and the sides of the pan. place the crust in the freezer while preparing the other ingredients. melt 1/2 maple or light corn syrup with 1 stick butter, and 1 cup of packed light brown sugar over a low heat in a saucepan. add i teaspoon vanilla extract, and let this mixture stand for at least 10 minutes to cool. this mixture needs to be cool before the eggs are incorporated. 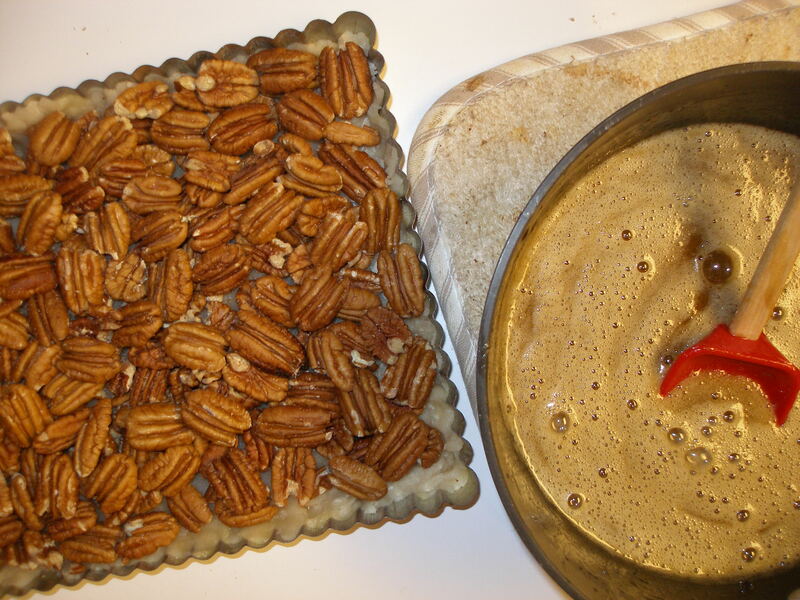 when cooled, remove the tart crust from the freezer and arrange 3/4 pound of whole pecans or mixed nuts if preferred. whisk 3 eggs into the cooled filling, until the consistency is similar to caramel. this step required an electric mixer to achieve the correct consistency. next, pour this mixture over the nuts in the tin. bake in a 350 degree oven for at least 40 minutes, or until the filling is set and the pastry is golden. i baked my tart for 50 minutes and it was perfect. this tart could be made up to two days in advance and it would still be perfect. i won’t say this is a calorie free recipe, nor is it healthy. but, it was delicious and a treat to have just once a year. 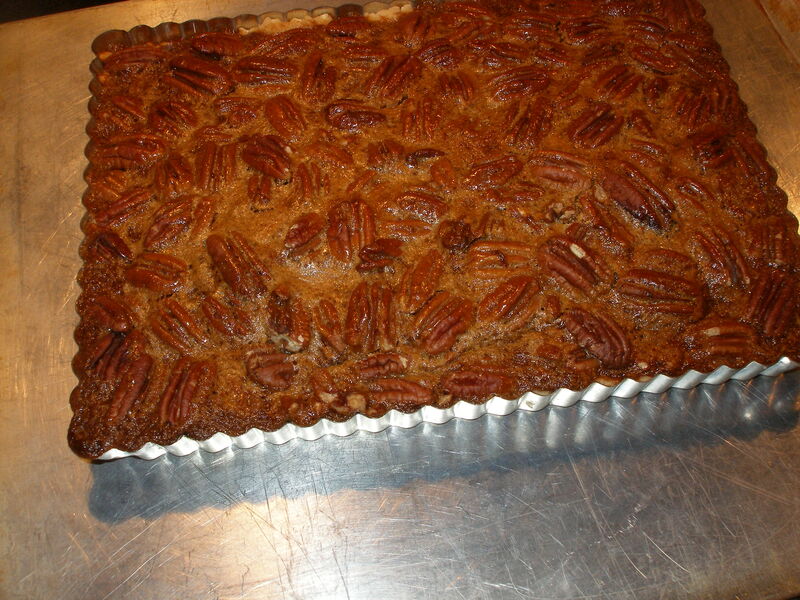 my family loved this pecan pie tart. i think i will make it for thanksgiving next year.